"Where the turf meets the surf." It's a gorgeous Sunday as dh, Child #3, Child #4, a grown-up friend and I head about 20 miles up the coast to spend the day at the races with a couple more friends. Open from July to Sept. 3, this is the last weekend of racing till next summer.There were ten races, some over a mile, some under, some on turf, some on dirt, all with thoroughbred horses. Child #3, Child #4 and I (the only neophytes in our little party) learned lots of fun wagering terms like scratch, exacto and across the board. A furlong is 660 feet or 1/8 of a mile, in case you were wondering. We bet on every single race, usually a whopping $2.00. 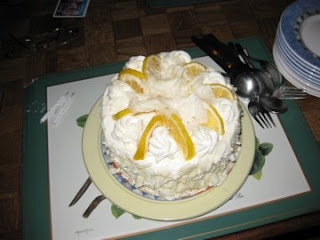 Such self-restraint means we'll pay our mortgage next week. Just so you know, I actually took this pic. Now, for the million dollar question: How did we figure out which horses to bet on? percentage of wins for the post position X percentage of wins for the jockey X percentage of wins for the horse. Calculate this number for each horse in each race (good practice for your math skills), then choose the horse with the highest number and a pay-off around 5:1. Friend #2 chooses a horse based on how she feels about its name and whether she likes the colors of the jockey's outfit. I used a mixture of the two methods and actually predicted the race winner twice. 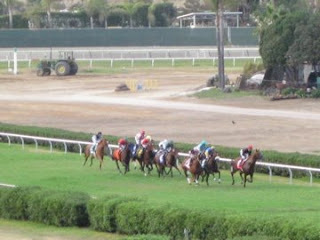 (Thank you Jockey Garret Gomez.) But I did not get rich. Dh will be schlepping off to his day job early Tuesday morning. Friend #2 won more money than Friend #1. And did not risk a headache working out complicated equations on a calculator in the sun. 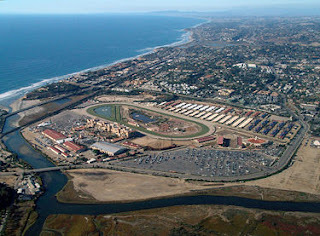 The Del Mar Racetrack opened its doors (gates?) in 1937 after Bing Crosby, Pat O'Brien, Jimmy Durante, and Charles S. Howard all partnered up. Yes, that's Charles S. Howard, owner of the legendary Seabiscuit. Bing used to hang out at the entrance and personally greet visitors to the track. No one famous greeted us today, although the ticket takers were all well dressed and friendly. 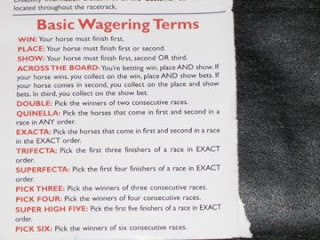 And here's some betting terminology from the inside cover of the racing program. What does a day at the races cost? $8 for parking + $6 entrance fee + $10 if you want a seat in the shade (you don't have to go this route and can bring your own chair and umbrella/hat and get in for the $6 fee only) + $20 (if you want to bet the minimum $2 per race. You don't have to bet at all. You can bet on as many races as you want.). Feel free to bring your own food, and you probably want to as food and drink prices are super high. For links to more My Town Mondays, visit Travis Erwin's blog. He's our fearless leader. Thought you might be interested in what we intrepid travelers were reading on our LONG LONG flight from Buffalo to San Diego. Off topic for a sec, I think Southwest Airlines might want to consider investing in an up-to-date map of the United States. Even I, a woman who can barely make it to the end of her driveway without a Garmin, know that it makes ZERO sense to fly from Buffalo to BALTIMORE and then San Diego. Southwest, please research the expression "as the crow flies." Yes, yes, I understand there are weirdo rules about hubs and flight patterns. BUT we live in an age of expensive gasoline and over-extended busy lives. Why don't you stand up, be a leader and fly DIRECT. AND, if you're going to make huge geography faux pas resulting in HOURS of extra air time, please offer a hearty, substantial meal. Preferably something steak-ish. With a robust red wine. Toss out the cockpit window those mini packets of salty nuts and teeny tiny cans of coke. Luckily for you, Child #3 had the presence of mind and stomach to suggest we grab some Quizno subs on our dash through the Baltimore airport. Because a hungry child #3 and a hungry child #4, well, let's just say it's not a pretty sight. Words of wisdom from Child #3 (age 12 years) regarding The Lightning Thief by Rick Riordan: It's a fantasy. It's a mystery. It's great. From Child #4 (age 8 years) about The Talented Clementine by Sara Pennypacker: Clementine has so many talents that she can't choose one. Me: Over the Edge by Norah McClintock is a magnificent teen mystery. Chloe figures out why classmate Peter winds up dead at the bottom of a cliff. This is one of several "Chloe and Levesque" mysteries. I'll definitely order the rest of them. 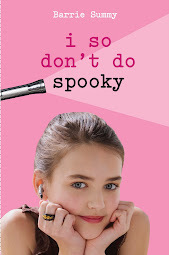 This book is appropriate for younger readers as well. Nothing untoward happens. (love that expression, but can never find a place to use it!) Thank you Niece K for the recommendation. And for the book which I, ahem, left on the plane. No worries, though, I'll order one from amazon and have it shipped to you. From the Class of 2k8: Here's a link to a contest for a free signed middle-grade book: Up and Down the Scratchy Mountains by Laurel Snyder. Laurel is a classmate from the Class of 2k8. She's easily one of the most creative people I know. 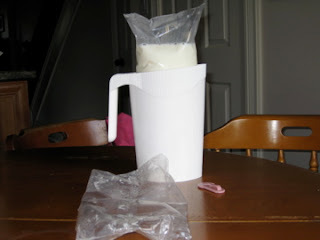 This is her launch week on the Class of 2k8's blog. I'm sure you'll get a kick out of her posts. I'd had the brilliant-ish idea of flying out of Buffalo. And we did not allow for the fact that Toronto has two seasons: winter and construction. There was tons of traffic on the QEW (Queen Elizabeth Expressway) and tons of tourists travelling across the border to the US via the Peace Bridge. When we finally arrived at the airport, our plane was pulling out. All Southwest flights for the rest of the day (Saturday) and the next day (Sunday) were overbooked. Not a seat to be had. So, we decided to turn the whole experience into an adventure. Thank you sisters, Niece K and Child #3 and Child #4 for the fun! 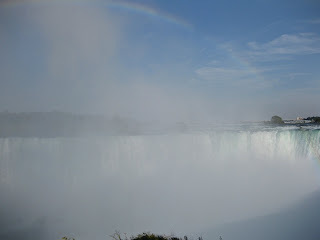 We drove across the Rainbow Bridge back into Canada and headed for one of the seven natural wonders of the world--Niagara Falls. 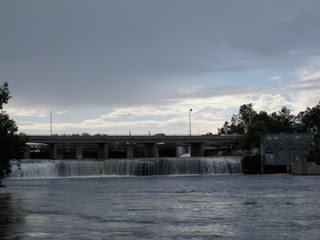 Some facts about the Falls: The water flows over the falls, down the Niagara River to Lake Ontario, down the St. Lawrence Seaway and ends up in the Atlantic Ocean. 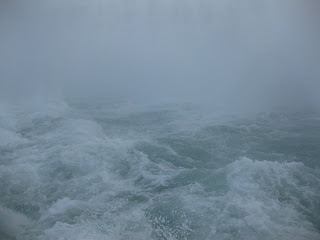 The water beneath the Falls is 170 feet deep. 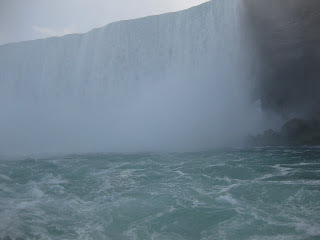 The brink of the Canadian Horseshoe Falls measures 2500 feet. 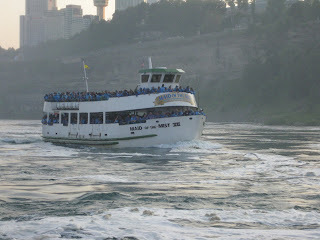 None of us had ever ridden the Maid of the Mist. And now we have. Fantastic!! Amazing! Don't miss it! It was windy. Wet. Incredible. For our Fearless Leader, Travis Erwin's My Monday Post, please visit his blog. He'll also have links to other Mondayers. P.S. Just so that you don't worry--Southwest Air booked us on new flights free of charge and we'll be home late tonight. My sisters are braving the drive to Buffalo once again. They are that great! And, thank you DH for being such a good sport about it all. As I've just finished packing to head back to Southern California tomorrow with Child #3 and Child #4. According to www.phrases.org, this sucky English proverb dates back to 1374 and Chaucer. Not feeling too kindly toward Chaucer at the moment. I'm not at all ready to go home. 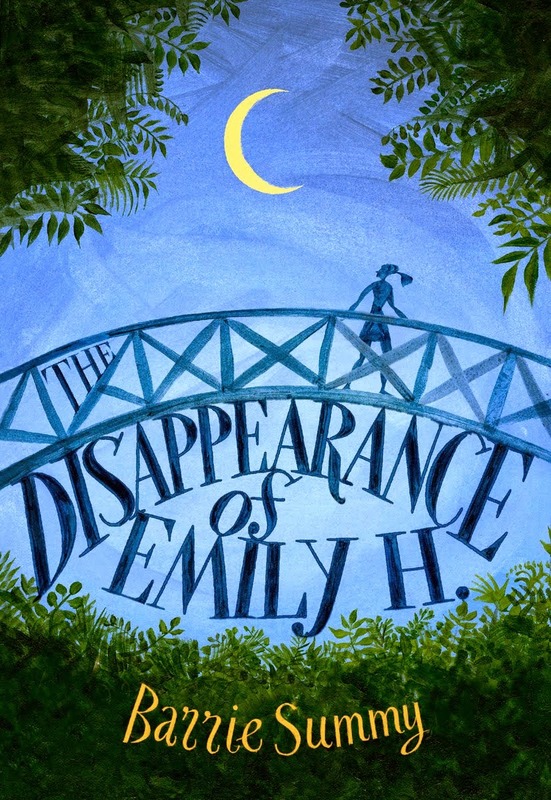 Of course, I'm looking forward to seeing dh, Child #1, Child #2, Dorothy the Dog and the chameleon. But...we were still having so much fun in Canada. And I have an incredibly busy fall in the offing. I just want to stay here and play with my sisters and my nephews and nieces and my friends. I'm sad and grumpy and feeling sorry for myself. Not to mention that I know I'll be tired tomorrow because I'm staying up way too late. 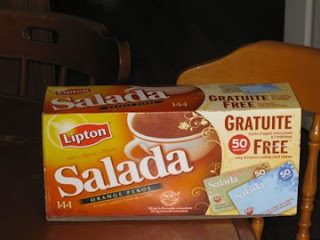 Anyway, you'll be glad to hear that, even in my misery, I remembered Becky Levine's suggestion that I bring back some Canadian treats for giveaways. I've packed a box full of delights like ketchup potato chips, all dressed potato chips, aero chocolate bars, smarties and I forget what else. So, leave me a comment (on this post) by say, Tuesday, Aug. 26, and I'll have Child #4 choose a winner for one of these "exotic" items. 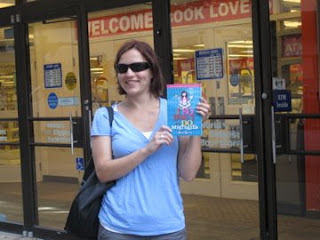 Here's Taylor standing outside the World's Biggest Bookstore with an ARC of I So Don't Do Mysteries. Once inside, Taylor introduced me to the manager and various booksellers and handed me a Sharpie and a box of ARCs. I wanted to call a time-out, freeze everyone in the moment and step back to take it all in and commit it to memory. So many firsts. First time to be introduced in a bookstore as an author. First time to sign a stack of books (albeit ARCs). First time to hand my first book out to real live book-loving strangers. And to think the last time I stood in this bookstore was on a winter evening near the end of an uncomfortable date. I knew things weren't going to work out with this particular guy. I'm not sure if he sensed it by this point or not. There was a hole in the bottom of my boot and I'd stepped in a slushy puddle when crossing Yonge Street after our dinner at a Chinese restaurant. My foot was like a block of ice. Life is so full of strange twists and turns. 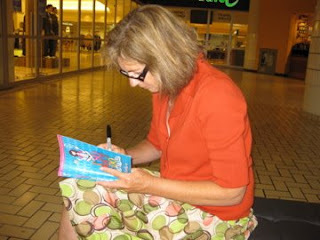 I'm signing ARCs before entering Chapters Indigo at The Eaton's Centre. At the Chapters Indigo bookstore in The Eaton's Centre, there is a very enthusiastic and animated and knowledgeable bookseller in the children's section. Her name is Marlene. Seriously, I'd buy a math text book from her. And pay full price. Just so you know, Marlene, I did take your advice and visit those other Chapters Indigo stores! And then it was on to the Random House Canada downtown office which is located in a tall building near the St. Lawrence Market. I don't always feel comfortable in office buildings. Probably because I spend most of my time in my house or my backyard or at my children's school or on pool decks (watching children swim or play water polo, not sun tanning!). There's something very special about a office building filled with books and people who love books, though. Here's Nicola Makoway, Publicity Manager. We talked kids and books and cab rides. She's the type of person you'd like to try a new restaurant with. Fun and witty and interesting and smart. Nicola had me sign many ARCs. Handwriting is so not my strong suit and I'm embarrassed to admit that a few of the signatures actually have three r's in Barrie. Sorry it has taken so long to get this post up. 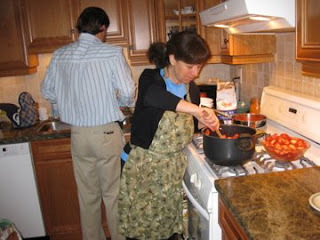 Blogger was misbehaving. 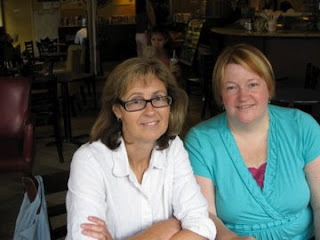 Yesterday, I met up with Maureen McGowan for coffee and a treat. (Yes, yes, I know the picture is better of Maureen than me, but there are only so many times you can interrupt a stranger who's peacefully perusing the paper (a day for alliteration!) at the table next to you!) And, Maureen, I forgot to tell you how much I love your highlights! Anyway, Maureen and I originally met online, and now we've met three times (oh, or maybe four?) face to face. 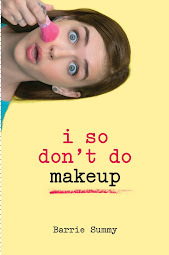 She's fun and interesting and insightful and a terrific writer. If you ever get the opportunity to chat with her in real life, don't pass it up. Something that's really struck me this trip is how easily I've fallen back into friendships. It's as if I saw these people a few weekends ago. When, in reality, I haven't been home in eight years (I will never go this long again, but that's another story). I think this level of comfort and ease despite a long separation must be a true test of friendship. I'm lucky to have these people in my life. Thank you DM, best friend from high school, for arranging the dinner for our hen night. It was great to see JW and ST too. Thank you ML, roommate from my University of Toronto days, for driving down from Barrie. 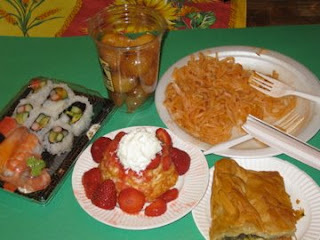 And a huge huge thank you to KJ for the magnificent dinner party complete with hors d'oeuvres and salads and Swiss Chalet chicken (because you read on the blog I was dying for Swiss Chalet). And for inviting the crazy Bs from Newmarket. 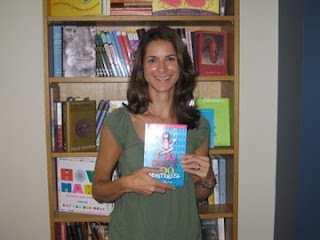 And thank you for chauffeuring me and my ARCs and my bookmarks around to various indie bookstores. I needed your cheerleading. It's going to be tough to leave. 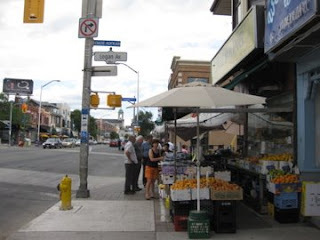 You get to shop along the Danforth with a sis. 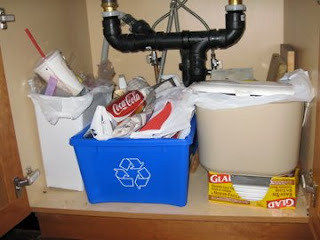 You have to sort your garbage (refuse, recycling, organic). 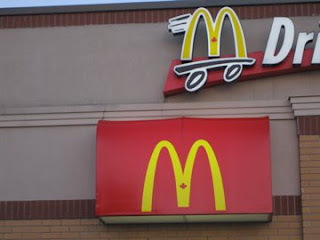 McDonald's has a maple leaf on its sign. I'm in Canada, in southern Ontario, to be exact. We're having a GREAT time! And I wanted to share it with you. Sorry this post is late. I'm literally in a little government building at the side of a highway where there is one computer with internet access for the public. 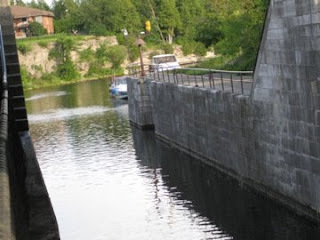 So, this week, my My Town Monday is about FENELON FALLS, Ontario. 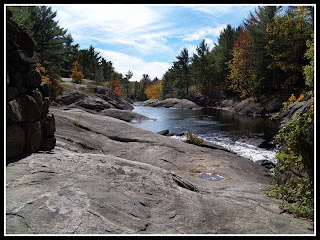 A few quick facts from Wikipedia: Fenelon Falls, "the Jewel of the Kawarthas", was incorporated in 1874. 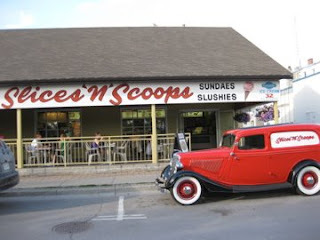 It's a village, primarily a tourist town, in the City of Kawartha Lakes. 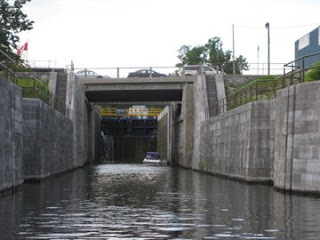 Construction began on the lock in 1885. Today the population is about 1800. This past weekend, we spend some times at a cottage in Fenelon Falls, visiting my aunt and uncle, my cousin and various other fun people. The falls are only on display on weekends. During the week, the water is diverted through a power station where it generates electricity for the town. My very fun cousin offered to play guide and boat us through from Sturgeon Lake to Cameron Lake. 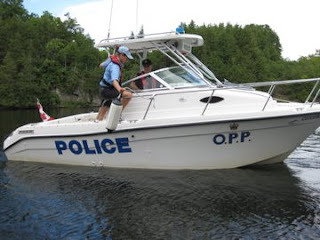 My very fun cousin and I have had lots of adventures together, so I wasn't the least bit surprised when we were stopped by the OPP (Ontario Provincial Police). 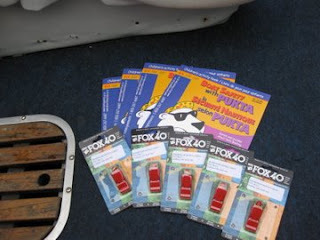 They generally check for such things as lifejackets, a whistle, a bailing can a floating flashlight. And, of course, no alcohol on board. Officers Cara and Carly could tell immediately that we were upright and outstanding citizens (at least with our children present!). We all had a nice chat and the officers gave us colouring books and plastic whistles. My very fun cousin and I are looking forward to hours of colouring (I'm better at staying in the lines) and whistle-blowing (he's a more boisterous and noisy type). 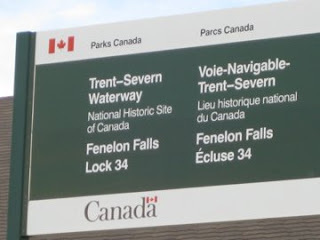 Fenelon Falls is Lock #34 on the Trent-Severn Waterway. 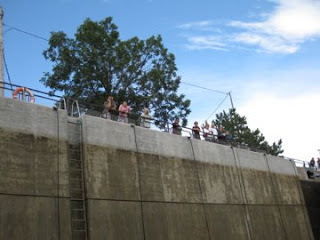 We are entering the locks. In front of us is where the doors will close. Then water will flow in from Lake Cameron. 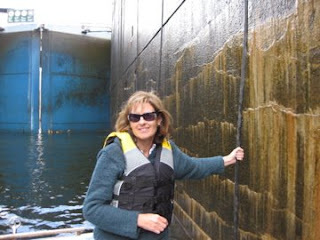 Here I am holding onto a cable so that we don't float all over the place in our "water elevator." See how responsible I am. If you look closely, you'll notice the doors to Lake Sturgeon closing behind me. Here are some friendly people waiting to chat with us when we float up to their level. If you drive your boat further in this direction, you'll reach Chicago. 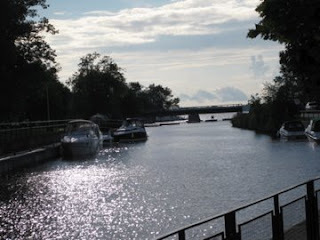 From there, you can wend your way along more inland waterways and get to the Mississippi River. Now, that would be exciting! If you keep travelling in this direction, you can make it to Florida. And that would be exciting too! We climbed up off the boat and indulged in some ice cream. And the butterscotch was just as good as I remembered. 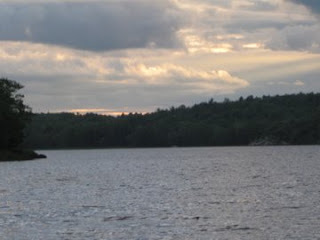 For more My Town Monday posts, please visit Travis Erwin's blog.